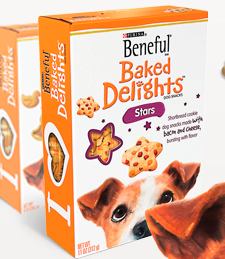 "Beneful® Baked Delights™ - Give your buddy some oven-baked love with Stars and Hugs. The ingredients and the sharing. It’s our affection baked and packed in a unique snack. It’s like a joyful hug in a playful treat. Introducing all new Beneful® Baked Delights™." "*Good only in U.S.A., A.P.O. 's, F.P.O.'s. Void where taxed, prohibited, restricted. Allow 6-8 weeks for shipment. LIMIT ONE REQUEST PER INDIVIDUAL OR ADDRESS. Must Like the Beneful Facebook page to order."